There are some things I will never grow out of! Have a Happy Easter, if you're celebrating! Sara has always loved cats. She surrounds herself with pictures of cats, stuffed cats, even cat-headed slippers. But she’s never been allowed to have a real cat of her own. Her father has always told her no, for reasons he won’t explain. So when a fluffy snowball of a kitten darts through their front door and into her life, Sara believes her dream might finally come true. But convincing her father to break his strict No Cats policy seems impossible. She has less than a week to persuade him that this kitten is exactly what their lonely, broken family of two needs to heal. Told in lyrical, spare verse, Serendipity & Me is a sparkling novel that elegantly handles the topic of loss for a middle grade audience. Share a little about how you ended up as a writer. I remember writing my first poem on my blackboard at home when I was about 8. I still remember the poem, but I won't repeat it because it was pretty awful! When I got a few years older, I realized the wonderful children's books I read were written by people, and since I was a person, maybe I could write them too. Ever since that realization, that was my dream career. I got my first publishing credit (a poem) before I graduated from college. Although I was able to get poetry and nonfiction published in several different areas, it took me decades to break into the children's fiction world. How did the idea for your story emerge? The girl's voice came to me through her poems. The thought that her mother had died just appeared in the main poem. 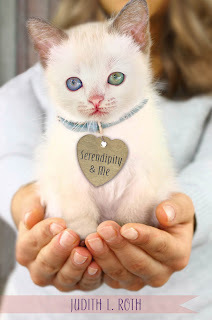 Serendipity and Me began as a picture book called Serendipikitty. I felt my way through the story as I wrote. When an editor told me she thought I had more to say about the father and daughter and suggested I write it as a novel-in-verse, that's when the hard work began. I had to find out who these people were. They didn't even have names at that point. What was the most challenging aspect of writing your book? Trying to incorporate the revision suggestions that the editors had. I like to work alone, and it's hard hearing what the story needs from an ultra-interested party. It's hard to satisfy them and still keep your footing in the story. My editors were very kind and smart and easy to work with, but that was the most challenging part for me, I think. Also, figuring out the timeline of when things happened. It's strange to me to make up time when things happen. It's easier if it comes of its own accord. This might have been more of a problem since it started as a picture book and had to be made into a more concrete period of time. Each book I write teaches me something about the world, myself or the process of writing. What did you learn through writing your book? That it's so much easier to revise a picture book! I know some people won't agree with me, but I find a smaller canvas easier to work with. I also learned from my editors that I need to become more conscious of putting the reader into the story with details of the environment and the characters. In the early drafts, I relied too much on poetic inferences instead of fleshing it out for the reader. Could you tell us a little about how you got your agent? Stephen Fraser was an editor at HarperCollins when I sent him the picture book version of Serendipity and Me. He called to ask me if it was still available, so I knew he was fairly serious about it, even though he didn't end up taking it to the editors' meeting. When I heard he became an agent, I asked him if he remembered me, and he said yes, that I could send him that manuscript to look at again. I did, and he and Jennifer De Chiara decided to sign me. He was able to sell Goodnight, Dragons for me first. Because I love reading as much as I love to write, I’m always curious about what other people like to read. Do you have any favourite books? Billions. But two that have struck me recently are The Book Thief, by Markus Zusak and The Sky Is Everywhere, by Jandy Nelson. I would have loved to have written either of those books. Is there anything else you’d like to share about your book or an upcoming project? I knew there was something touching about this kitten story when a writing friend was reading the picture book version of Serendipity and Me aloud to another writer--and she had to stop because it was making her cry. There's something affirming about tears. Is that awful to say? But I don't think of it as a sad book, maybe because the death took place several years before the time setting of the book. Right now I'm working on an historical novel--not in verse, not in first person. Very different from what I usually do. I hope you all enjoy this interview as much as I did! It's always interesting to hear about how a book comes to be published. A fun fact I learned from Judy is that the cat in the story was loosely based on a real cat named Jasmine. Thea and her dad are always on the move, from one small Cariboo town to another, trying to leave behind the pain of Thea's mom's death. They never stay long enough in one place for Thea to make friends, but when her dad gets work renovating a guest ranch on Gumboot Lake, she dares to hope that their wandering days are over. At the ranch she makes friends with Van, a local boy, and works hard to build the trust of an abused horse named Renegade. When Thea unearths the decades-old story of a four-year-old girl who disappeared from the ranch and was never seen again, she enlists Van to help her solve the mystery. When some disturbing facts come to light, she finally starts to come to terms with the losses in her own life. Even more than the mystery in this story, I enjoyed the emotional subplots of Thea working with Renegade to build his trust, thinking about her relationship with her mother through her memories, and working to develop friendships in a new place where no one seems to notice her. I really liked the author’s writing style, where no words were wasted and just the right amount of detail was included to help me picture the setting and characters. This is another story where the voice drew me right in. It helped me connect with Thea and see the world from her perspective. I love the way the author weaves in small, specific details that help to make the story and setting more authentic. I’d study this novel to see how to include clues to a mystery and leave space for the reader to put the pieces together. Becky Citra is a full-time writer who lives on a ranch in a small place called Bridge Lake in British Columbia. Her recently developed blog http://beckycitra.blogspot.ca/ contains great tips and advice for writers and book recommendations. I’ll definitely be following it to learn more about writing. 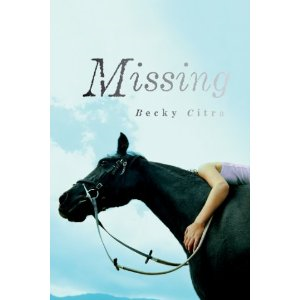 Missing is nominated for an Ontario Library Association's Forest of Reading award in the Silver Birch category for 2013. Other nominated books that I’ve featured include: Dragon Seer's Gift by Janet McNaughton, Cat Found by Ingrid Lee, A Tinfoil Sky by Cyndi Sand-Eveland, The Mighty Miss Malone by Christopher Paul Curtis, Making Bombs for Hitler by Marsha Forchuk Skrypuch, The Dead Kid Detective Agency, and The Grave Robber's Apprentice. For more, visit Becky Citra’s website. Marvelous Middle Grade Monday was dreamed up by the incredible Shannon Messenger, author of Keeper of the Lost Cities. Visit her blog for an up-to-date list of all the bloggers who are participating and posting about middle grade books today! I've been looking for a picture book about Earth Hour to read to my kindergarten students. So far, I haven't found one that specifically focuses on Earth Hour. If you've come across one, I'd love to know about it. Maybe there's an opportunity for someone to write one, since Earth Hour seems to have become a worldwide tradition! To celebrate Earth Hour at my house, we usually play a board game by candlelight (and eat snacks). Do you have any great ideas for celebrating Earth Hour? 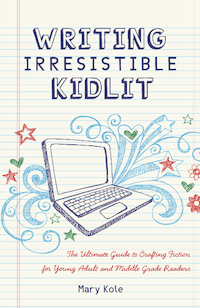 I recently finished reading Writing Irresistible Kidlit by Mary Kole, a writing guide for middle grade and young adult fiction. It has taken me a couple of months to get through it because it’s so packed with information. Even though I don’t consider myself a ‘newbie’ writer, and I’ve read many craft books, I learned a lot from thinking about the ideas in this book (for example, the explanation of high concept, the emphasis on character’s thoughts and “interiority”, big ideas and themes and what they can do for a novel). Many of the points Mary makes are illustrated with examples from both MG and YA literature. So it helps if you’ve read a good selection of books in these categories. I think it’d be worthwhile to take the list of books she’s taken the examples from and read them all, then then re-read her book again. Although it’s not necessary to do this to learn from this book, it’d be great for a second pass through. There is so much in this book, I’m sure I’ll return to it, if only to read specific sections for a particular aspect of the craft that I’m working on. When I read craft books, I usually jot down points I want to remember and there were lots of those for this book. But I also paused to spend time thinking about how what I was reading applied to my latest project. I ended up making even more notes on my own story than I did on this book. To me, that’s a sign of a really useful craft book. Reading this book helped me pinpoint what my story needed. It was a little discouraging when I realized how much work it will take to get my story where I now want it to be, but because of Mary Kole’s insights and examples, I have a good sense of what to work on. Hans is on the run from his adoptive father, a grave robber who found him as a baby hidden inside a wooden box that washed ashore. Now fate has introduced Hans to Angela von Schwanenberg, a young countess fleeing the evil forces of Archduke Arnulf, who has chosen her to be the next in his long line of brides, and the dreaded Necromancer. Together, Hans and Angela gallop through dark forests, treacherous lands and secret passageways on their quest to uncover the truth about Hans’ shadowy past and save Angela’s parents from the archduke’s monstrous asylum. In this world of highwaymen, hermits and dancing bears, anything is possible—even for a grave robber’s apprentice. Brimming with action and ghoulish delights, The Grave Robber’s Apprentice is a grand fantasy adventure from one of Canada’s most acclaimed authors for young readers. I loved all the twists and turns in this adventure. I mostly read the book straight through without putting it down, because I wanted to find out what happened to Angela and Hans. I really enjoyed Angela’s determination—and her love of puppets. She was a great team with Hans, and there were a few hints that she might have a crush on him. Although overall there’s a sense of fun and playfulness to the story, it also has some distinctly creepy elements. From a writer’s perspective, the first thing that stands out for this story is the voice. There are also lots of embedded references to Shakespeare’s plays and fairy tales, which are interesting to look for. Allan Stratton is a full-time novelist and playwright who lives in Toronto. He has four cats. The author dedicated The Grave Robber’s Apprentice to his mom, who took him to see Shakespeare’s Twelfth Night when he was very young and encouraged his love of theatre. 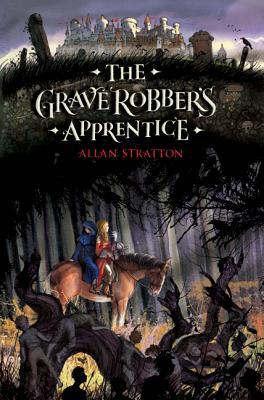 The Grave Robber's Apprentice is nominated for the Ontario Library Association's Forest of Reading award in the Silver Birch category for 2013. Other nominated books that I’ve featured include: Dragon Seer's Gift by Janet McNaughton, Cat Found by Ingrid Lee, A Tinfoil Sky by Cyndi Sand-Eveland, The Mighty Miss Malone by Christopher Paul Curtis, Making Bombs for Hitler by Marsha Forchuk Skrypuch and The Dead Kid Detective Agency. For more, visit Allan Stratton’s website. Or check out this cool trailer for The Grave Robber’s Apprentice. ﻿﻿﻿﻿﻿Just for fun, I decided to enter author Susanna Leonard Hill's In Just Spring Contest. In case you don't know, Susanna's blog is a great place to hang out if you write picture books (or if you write any kind of children's books). She has really useful features like Would You Read It on Wednesdays, where writers can get reactions and critiques of their short pitches and Perfect Picture Book Fridays, where you can learn about great picture books for read alouds. Susanna is a writer that really gives back to the writing community and I'm so glad to have found her blog. Write a children's story, in poetry or prose, maximum 350 words. The story must be about something that really says "SPRING" to you - something that really makes you feel that spring is here! The only other requirement is that the last line must be "[Character Name] knew Spring was really here!" or "[Character Name] knew Spring was here at last!" Your entry should be posted on your blog between Friday March 15 at 12:01 AM EDT and Monday March 18 at 11:59 PM EDT, and your post-specific link should be added to the link list on this post. Everyone was talking about SPRING, but Roxy had no idea what that meant. She trotted to the treat cupboard. No one paid any attention. SPRING couldn’t be about food. She dropped her rubber bone in a lap. It fell to the floor. SPRING wasn’t about fetch. She flopped on her bed and sighed. SPRING obviously wasn’t for dogs. “Come, Roxy. Let’s go on a Spring walk,” said her girl. Roxy danced through squishy grass. She barked at a bright-chested bird. And she stared longingly at a ball slapping into a boy’s gloved hand. SPRING was a smell? Roxy absolutely loved smells. But there were so many. The leftover people smell of a soggy mitten. The earthiness of a wriggly worm. Puddles. Leaf shoots. New grass. Rubber boots. Roxy caught a whiff of something fresh. Something different. That had to be it! She lunged for the smell. Her leash slipped free. But Roxy had to find SPRING. She splashed through trickling water. A fat bird snapped. A whole line of little ones peep, peep, peeped. Roxy sniffed, but they were not SPRING. She scrambled up a muddy bank. A small, spotty lump hop, hop hopped. Roxy sniffed, but it was not SPRING. The fresh, sweet smell of SPRING filled her nose. She was close. But Roxy couldn’t. SPRING smelled too delicious. Her nails clicked on the sidewalk. Ding-a-ling! Ding-a-ling! Wheels gritted to a stop. Roxy’s nose twitched. She drooled. She shook off the mud, ready to sniff up SPRING. “Get that muddy dog away from the ice cream!” cried someone else. At last! SPRING! Roxy licked as fast as she could. Since next week is the March Break for my kids, I'm going to take some of the advice I've been reading over the last week or so and make time for some fun! Although I'm sure I'll still be writing (and hopefully more focused writing), I'm going to be taking a blog break in order to spend more time with my family and to get ready for spring. Spring's coming, right? See you back on the blog on Monday, March 18th! Following the advice of Joanna Penn in How to Write More and And Create a Daily Writing Habit and James Scott Bell in How To Work on More Than One Book at a Time, I've been setting a daily goal or quota for how many words to every day, and trying to stick with it. Trying to meet a quota means that I'm thinking about my story every day. Momentum builds and carries me on to the next part of the story. It's hard some days. But every time I write 100 words, I'm 100 words closer to finishing my story. You know how your best ideas always come when you're in the shower, driving to work or walking the dog? This may sound crazy, but one day I thought, why shouldn't those best ideas be about my current project? If I read a chapter or a couple of pages of my project before I walk the dog or drive the kids to school, it gets my brain primed for writing later. Even if I don't have time to sit down at my desk right away, the story is in my head when I do get a chance to work on it. This also helps with the problem of spending all my writing time rewriting yesterday's work. Because I've already done the re-reading a while before, I've already been working on it, somewhere in my subconscious. I can quickly skim and get on with the new part. Is it possible to write too much? Sometimes I get so obsessed with writing that it takes over other parts of my life. A couple of hours can zip by like nothing, even if all I've written is a paragraph. So lately I'm making sure writing stays in its place and doesn't spill over into time with my family or time for taking care of myself. Surprisingly, when I do write, I'm more focused. Do you have any tips for being a more productive writer? Thirteen-year-old October Schwartz is new in town; short on friends and the child of a clinically depressed science teacher, she spends her free time in the Sticksville Cemetery and it isn’t long before she befriends the ghosts of five dead teenagers, each from a different era of the past. Using October’s smarts and the ghosts’ abilities to walk through walls and roam around undetected, they form the Dead Kid Detective Agency, a group committed to solving Sticksville’s most mysterious mysteries. So when the high school’s beloved French teacher dies in a suspicious car accident, it provides the agency with its first bona fide case, putting them in the midst of a murder plot thick with car chases, cafeteria fights, and sociopathic math teachers, and sending them on an adventure that might just uncover the truth about a bomb that exploded 40 years ago. This was an intriguing book. The concept of “ghost detectives” was engaging and I enjoyed the writer’s style and humour (though it might not be for everyone). Another unique aspect of this story was the incorporation of elements of Canadian history that I haven’t seen before in fiction—the FLQ bombings. The story alternated between first person and third person, which was a bit jarring and took a bit of getting used to, but I liked October (the main character) and was rooting for her to solve the mystery. Also, I think this is the first middle grade novel I’ve read that includes curling! From a writer’s perspective, I’d read this again just to get a sense for how to create a distinctive voice. This story has many unique elements that make it stand out from others that I’ve read. Evan Munday is an illustrator and cartoonist as well as a writer. He lives in Toronto and works as a publicist at Coach House Books. The Dead Kid Detective Agency book trailer is a Letterman style top five list of reasons why to read the book. 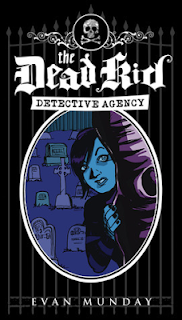 On his blog, Evan Munday has a sneak peak of a couple of the illustrations in the second book, called The Dead Kid Detective Agency: Dial M for Morna. The Dead Kid Detective Agency is nominated for the Ontario Library Association's Forest of Reading in the Silver Birch category for 2013. Other nominated books that I’ve featured include: Dragon Seer's Gift by Janet McNaughton, Cat Found by Ingrid Lee, A Tinfoil Sky by Cyndi Sand-Eveland, The Mighty Miss Malone by Christopher Paul Curtis and Making Bombs for Hitler by Marsha Forchuk Skrypuch. For more, visit The Dead Kid Detective Agency page at ECW Press. Marvelous Middle Grade Monday was dreamed up by the incredible Shannon Messenger, author of the middle grade novel Keeper of the Lost Cities and the new YA novel, Let the Sky Fall. Visit her blog for an up-to-date list of all the bloggers who are participating and posting about middle grade books today! Since I spend so much time driving kids around, I quickly finish my weekly supply of podcasts about writing. (My favourite, Writing Excuses, is only 15 minutes long but it's packed with information.) This week I was happy to discover a new one: PW KidsCast. It features some interesting interviews with children's authors about their books and writing. I'm so thrilled to add it to my playlist! I love her revision suggestion of putting only the scenes that are clearly working into a new document and then filling in the gaps! 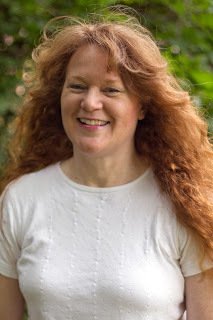 Cindy M. Hogan at Indelibles reminded me that it’s important to nuture other interests besides writing, because they do make your writing a lot richer: Looking Beyond Writer’s Conferences. And just for fun: have you seen this impressive Hogwarts Castle created by Alice Finch? The verdict: "It is SO COOL!" You can read more about it in this interview with Alice Finch.